VIDEO: Maiduguri residents flee as Boko Haram fighters invade town – Royal Times of Nigeria. 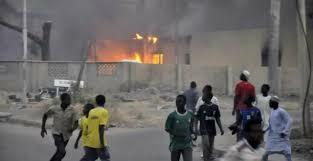 Boko Haram fighters disrupted the peaceful atmosphere in Maiduguri, Borno state capital, on Wednesday. Security agents engaged the insurgents in a gun battle that lasted hours. Though they were assured of safety, many residents fled their homes.